I'm going to document everything here, because that's what I do. When I'm an old man I suspect I'll get a kick out of revisiting these archives, so this entry is for Old Toronto Mike. We boarded the Tim Hortons bus at Rennie Park at about 5:30pm. It was rainy, but warm. James' stick and hockey bag was placed under the bus and he found a seat next to his buddy Cam where they could watch the on-bus movie, Alvin and the Chipmunks. From Rennie Park to the ACC isn't a particularly long journey, so they didn't get through much of the flick. We drove into the ACC via a ramp on the south side of the building. We parked next to the bus that brought the Oilers to the game. We waited in this area while security checked every bag and then we waited a little more for our reps from Tim Hortons. The Tim Hortons people would take us the rest of the way. We were taken to our dressing room via the back of the ACC, where we saw all the extra seats used for the Raptors basketball configuration, as well as several basketball nets and hockey nets. I'm not sure, but I think I also saw Oliver Miller stored away back there. Our dressing room was next to the Raptors' room, and down a hall from the ACC ice. They put the game on television and asked that the kids be in full uniform with 8-minutes left in the first period. 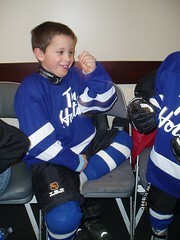 We were divided into a blue team and a white team and the kids got new Timbits uniforms. James got #10. With 8-minutes left in the period, and the game tied at zero, the players lined up, goalies first and then toggling between blue and white. While waiting to take the ice, Carlton the Bear showed up, as he would drop the puck. Then, I heard our team announced by Andy Frost and the game began. The game itself is a blur to me. It happens very quickly, and you're trying to pick out your #10 from the glass. Others took video, so I'll be able to see it soon. I can tell you that the game ended in a 1-1 tie, the crowd went nuts for the entire 4-minutes, James thinks he touched the puck, but isn't sure, and the intensity I witnessed far surpassed what I'd see the remainder of the Leafs game. It was a job well done, and the reward was another box of Timbits, another bottled water and a couple of tickets for us to watch the last two periods of the Leafs game. Oh yeah, and a Carlton the Bear puck and temporary tattoos. After the Leafs loss, we made our way back to our old dressing room and returned to the bus. There, well past their bedtimes, our Timbits (the players, not the donuts) watched more of Alvin and the Chipmunks before reaching our destination, Rennie Park. 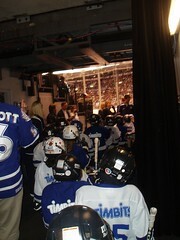 I hope the 18 kids who got to participate in this amazing experience never forget the night they played at the ACC. I know I never will. I've got a bunch of pictures in this Flickr photoset in case my memory starts to fade. Here's video evidence of Team Blue's goal I captured with my good 'ol digicam. Update: Here's the official ACC video that was shown on the scoreboard. That's awesome man...very cool stuff. Cool. How were the free seats? Here's a nice montage one of the dads put together. At the 3:18 mark, you can see me high five James and give him the classic "good job!" codexofdreams, our tickets were the very last row. There's really no bad seat in the house, however, and the price was right. The Air Canada Centre doesn't see much intensity these days. Here's some fantastic raw footage from a different angle. Thanks, Gail! I got so into watching the kids that my hand drifted up to the crowd. I can tell you all first hand that the crowd at the ACC was louder and on their feet way more for the plays our guys (including 2 young ladies) had than for virtually all of the Leaf game! The fans went wild. It's a night to remember. Awesome photos, what a thrill! Hey I think I know that dude.Isn't that JimBo the deck builder.Hurry up and grow up JimBo the Leafs need you.